Holiday Shopping Spree, Open House and Crafts Fair! 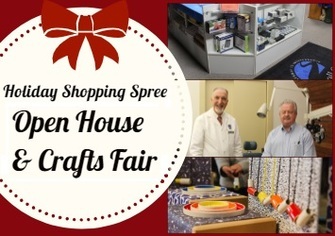 The Carroll Center for the Blind’s annual two-day Holiday Shopping Spree, Open House and Crafts Fair is taking place November 30 to December 1. There will be outrageous Carroll Store sales, special low vision seminars and even a crafts fair featuring products made by blind and visually impaired individuals. This two-day event is free to attend and is open to the public. Get yourself or a loved one glasses, watches, wallets, jewelry, adapted kitchen aids or magnification devices at a big discount! A wide variety of items will be 10% off. A FREE holiday gift is included with every in-store purchase, as well as complimentary gift wrapping and refreshments! We’re opening the doors to the Low Vision Lab to give you unprecedented access to the latest devices and techniques to get you back to doing what you love most. Get your hands on exciting new low vision assistive technology devices, discover the variety of audible and talking gadgets that exist and test out different CCTV’s as part of the all access pass to the Low Vision Lab. Breathtaking jewelry, stunning pottery, and various intricate crafts. All types of incredible handmade goods will be on display at this year's Crafts Fair. The Crafts Fair showcases a variety of artwork and crafts from local talent of blind and visually impaired designers, makers, crafters and dreamers. If you are a blind or visually impaired artist or crafter and would like to showcase your products, please contact us as tables may still be available.